PLAY THIS WAY EVERY DAY LLC. TOYDIRECTORY > PLAY THIS WAY EVERY DAY LLC. About PLAY THIS WAY EVERY DAY LLC. Created by a pediatrician with two sets of twins, Play This Way Every Day introduces the U-Play Mat for children ages one and up! 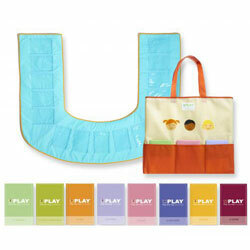 The U-Play Mat is a U-shaped mat with 15 clear pockets on its surface. The mat is 4 feet wide, and 3 feet deep. The innovative "U" shape allows the child to sit inside the opening of the "U" with full access to the 15 pockets. The child has full visual and tactile access to the whole surface, without having to crawl atop the mat. Child-safe see-through pockets allow fifteen theme-based cards to be secured to the mat surface. This patent pending design allows for the caregiver to sit across and engage the child in a variety of exercises using the adorable theme-based card decks. The pockets are designed to be slightly larger than the cards, allowing for the cards to be placed and removed easily. CREATED BY A PEDIATRICIAN WITH TWO SETS OF TWINS! FOR ALL CHILDREN AGES ONE AND UP! LEARNING TO TALK AND UNDERSTAND CAN BE FUN! TEN GAMES PER CARD DECK! EXERCISES GROW WITH THE CHILD! GET ON THE FLOOR AND PLAY THIS WAY EVERY DAY! Little kids, little fingers! Fingers like to touch. That's terrific, but when engaged in these exercises with cards behind the pockets, the child can still touch but not move the cards, allowing games to continue without interruption. This mat was developed with careful thought into materials, size and structure. There are rounded card edges (no poking), and there are no small parts or strings. 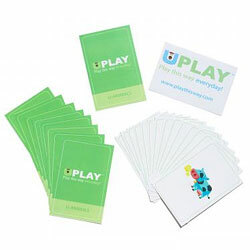 All Play This Way Every Day products are designed and tested according to applicable rules and regulations.